An effective, low-cost deterrent against unwelcome intruders (human or feline). 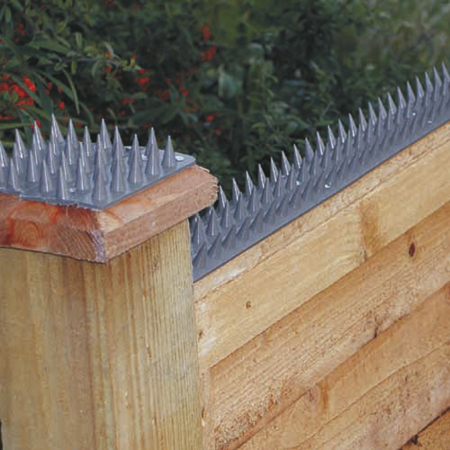 These polypropylene strips can quickly and easily be screwed, nailed or glued to the tops of fences, gates, walls and sills (a unique double-hinge design makes them easy to fix even on angled surfaces). Designed to deliver maximum discomfort, but minimum harm, they're weatherproof, durable and re-usable. 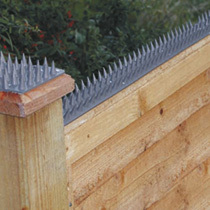 Each pack contains 8 50cm (20") long x 4.5cm (1¾") wide strips - a total of 4m (13'2") of protection.